Things We Love: Farmers’ Markets! Farmers’ Markets are one of the many things that we love here at Montclair Smile Design. 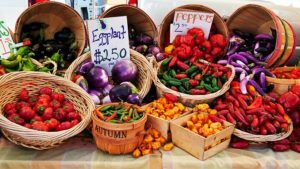 The local farmers’ market in the Montclair Village is rated one of the top farmers’ markets in Oakland… and there are a lot to choose from! With vendors selling things of all varieties, from fruits and veggies to nuts and baked goods, the market here in our little community is amazing! On Sunday’s from 9am-1pm, the streets of Montclair close down and are full of people from around the Bay buying local and organic foods. Don’t be surprised if you bump in to Dr. Becker or one of the staff members at the market… we frequent it regularly! Supporting local vendors and supporting the efforts to bring as much organic and locally grown food onto our tables is always in our minds. As many of our patients know, we are a dental practice that is focused on more than just your teeth. We incorporate the importance of total body health with an emphasis on the mouth being the gateway to the body. The importance of organic foods is another thing that Dr. Becker and Dr. Catalano highly value. There are many reasons to buy organic, but one of the big ones is because of how many less pesticides are found in and on the produce. As something that affects the entire body, especially those young in age, we love to buy organic whenever possible. Eating fresh whenever possible is also very important to us here. The more steps its takes for your food to land on your plate after leaving the garden (aka packaged foods) reduces the amount of all the good vitamins and antioxidants that comes with it. Here is one of Dr. Becker’s favorite vegetables: Eggplant! No coincidence that it’s her favorite color 🙂 The first thing you smell at a farmers’ market is…? BASIL! Here is a recipe for a simple and delicious pesto that will brighten your kitchen this summer. Comment below with any recipes that you love, using items from the Farmer’s Market!